This mini-book is a fun way to review the seasons. Students will enjoy guessing which season is being described. Then they get to write about their favorite season and explain why they like it. Connecting personally with the subject makes for powerful learning. 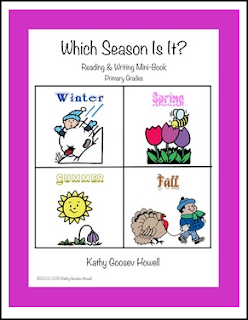 This mini-book can be used during any season. Copy the pages and cut them in half along the lines. Then staple the pages together to make the mini-book. This download contains 4 pages plus the cover. The cover can be cut apart and laminated if you need to use it as a resource. The answers to the mini-book pages are winter, spring, summer, fall. I purposely did not mix them up so that the students would get used to learning them in the correct order. If you are enjoying my products please click on the Follow Me button to be notified of new listings, free items, and sales on my TPT store. If you have time please vote and leave some feedback.